Sumac spice comes from berries. The bush that produces these berries grows wild all over the Middle East and in the Mediterranean region. It is considered a relative of both sorghum and poison ivy, though it lacks the latter’s allergy-inducing volatile oils. Sumac is used throughout the Middle East in Turkish, Yemeni and Lebanese cuisines among others. Despite the fact that it is popular in these areas, it actually comes from sub-tropical areas in Africa and North America. 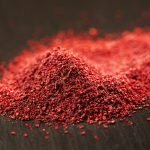 Sumac was a well-known spice and medicine among the Greeks more than 2,000 years ago. 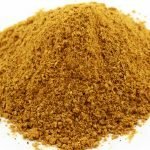 The Greek physician Dioscorides wrote about its health benefits and it has been in use by traditional healers and cooks since then. In Ancient Greece, its medicinal uses ranged from antiseptic to tonic. Native Americans also used the spice to make a beverage similar to beer. 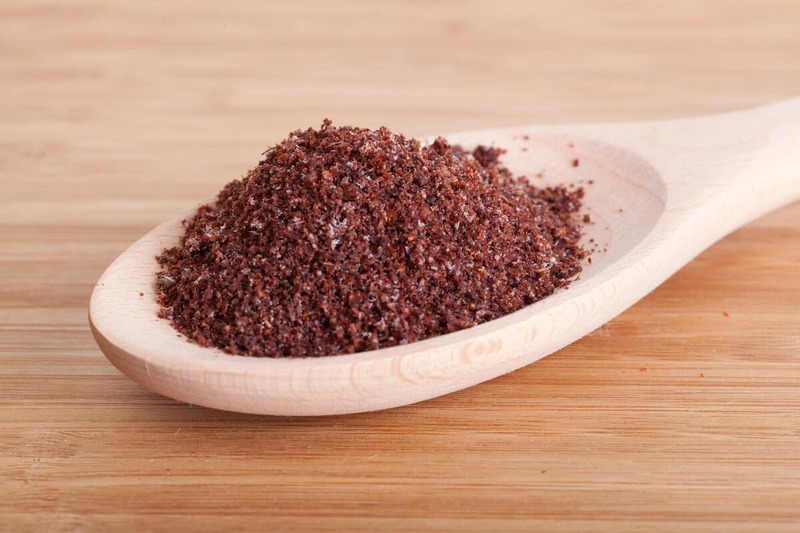 The flavor of sumac is widely described as being tart and fruity in a way that is similar to citrus. Its acidity is considered similar to that of vinegar and it was used to provide sour notes in dishes in the period before the Roman Empire brought lemons to the Middle East. 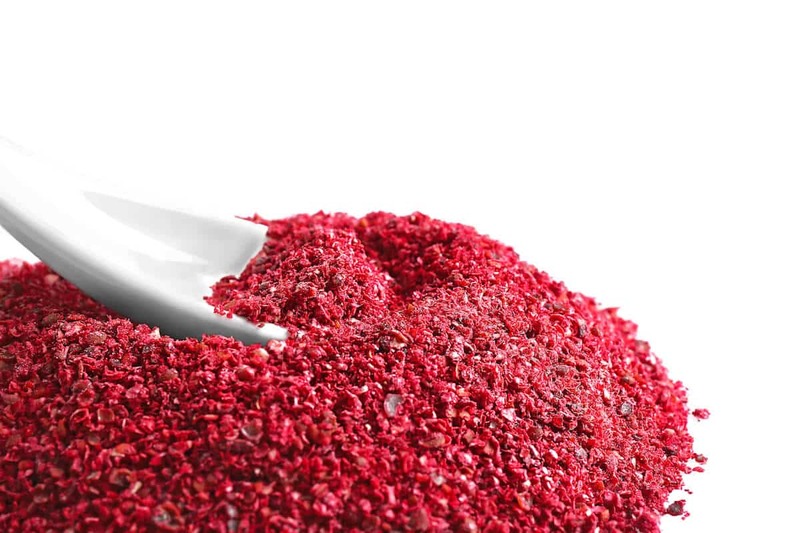 Antioxidants: A high antioxidant content is sumac’s main benefit as it as both the North American and Sicilian varieties of it are rich in compounds that neutralize free radicals. Free radicals are known to cause cancer and other health problems. It is so rich in antioxidants that some consider it a “superfood.” Among the antioxidants are vitamin C and omega 3 fatty acids. Tannins: Sumac berries contain tannins, which are present in grapes and cranberries along with many other fruits. Tannins are polyphenols and are considered to be anticarcinogenic. High blood sugar: A study published in the Journal of Pharmaceutical research has shown that sumac has the ability to lower blood glucose level by a significant amount. Infections from aspergillus flavus: Aspergillus flavus causes lung infections among people with compromised immune systems; these may include AIDS patients and those undergoing chemotherapy. Aspergillus flavus may infect any organ, including the kidneys and the brain. Sumac is a widely used condiment in Turkey and in Iran. The ground spice is sprinkled over rice or mixed with onions and eaten as an appetizer. Street vendors often season the famous Turkish street food doner kebab with ground sumac. In Jordan, the local blend of the za’atar spice mix contains sumac. To make Jordanian za’atar, cooks combine sumac with marjoram and other spices. Sumac is versatile and chefs have used it for everything from salad dressings and appetizers to desserts like ice cream and puddings. It is even used to make Bloody Marys. What's A Good Sumac Substitute?